The baby of the Kardashian clan is beginning to find her voice and she wants to talk about... chemtrails. Kylie Jenner, 17, is seriously disturbed about the white trails coming from the planes she often travels on – like the personal family jet she and her siblings took on a ski trip to Montana on the last episode of Keeping Up With The Kardashians. She seems to have bought into the chemtrail conspiracy theory. 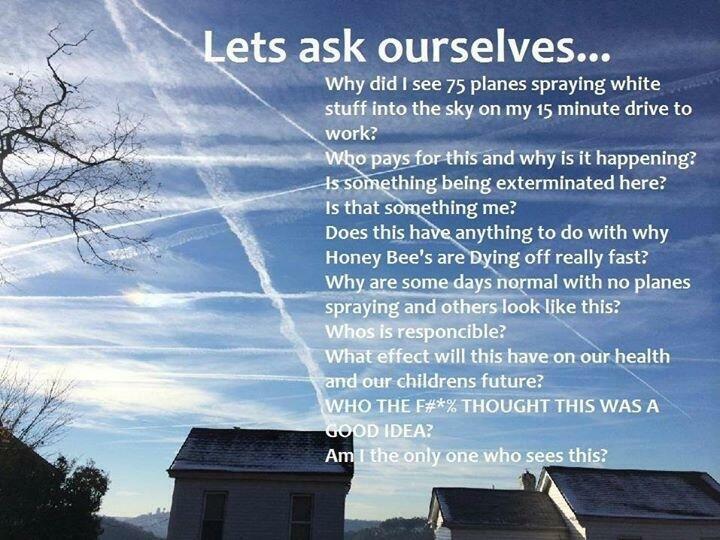 So she posted this alert (likely from another source) to her nine million Twitter followers: "Let's ask ourselves ... Why did I see 75 planes spraying white stuff on my 15-minute drive to work? Who pays for this and why is it happening? Is something being exterminated here? Is that something me? "Does this have anything to do with why Honey Bee's are Dying off really fast. Why are some days normal with no planes spraying and others look like this? Whos is responcible? What effect will this have on our health and our childrens future? WHO THE F#*% THOUGHT THIS WAS A GOOD IDEA? Am I the only one who sees this? [sic]"
No one's saying that jet pollution is a good thing, but most environmentalists don't subscribe to the long-standing American conspiracy theory about chemtrails that seems to have captured the imagination of the young lip-plumping philosopher, notes Buzzfeed. Chemtrail conspiracy buffs believe the white streaks that seem to be coming from jets are actually infused with chemicals from the US government, maybe to control the weather, but probably much worse. The conspiracy infection dates to a 1996 Air Force university report: Weather as a Force Multiplier: Owning the Weather in 2025. Most others see the white trails, known as contrails, as essentially water vapour from the planes. You see them "for the same reason you can sometimes see your breath", according to The Scientific American. "The water vapour contained in the jet exhaust condenses and may freeze, and this mixing process forms a cloud very similar to the one your hot breath makes on a cold day." To clarify things, comedian Rob Fee tweeted that he'd pay $25,000 (£16,000) to hear a TED talk from Jenner on chemtrails. The girl is game. "I'd do it," she tweeted back. "Ctrails to me are the easiest of all the things going on in the world for my followers to understand."